Neil Jordan new film (2012) revisits the vampire territory that he explored in the 1994 Interview With a Vampire. Like that film this offers a distinctive take on the genre. This is down in great measure to the script by Moira Buffini adapted from her own play. She clearly has a taste for the gothic, having also adapted Jane Eyre in 2011. Jordan’s output is closer to film noir, including frequent femme fatales. 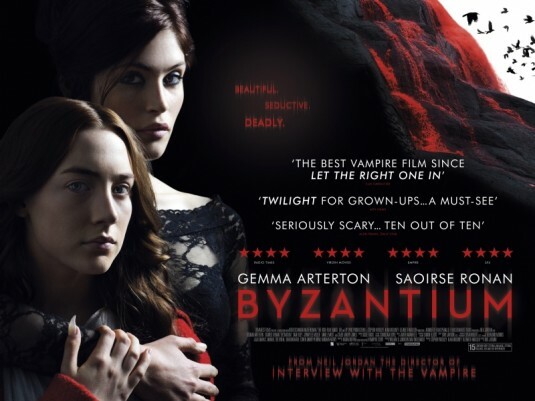 This offers the most distinctive feature of Byzantium, the central and strong female characters of Clara (Gemma Arterton) and Eleanor (Saoirse Ronan). Clara is a vital sexually dominant character, played with relish by Arterton. Ronan as Eleanor is suitably restrained as a moody and rather fragile teenager. By comparison the men, human or undead, are somewhat pallid in comparison. The June Sight & Sound had an article by Kim Newman who traces the film vampiric lineage in Deadly is the Female. None of the titles he mentioned seem to have a woman with as much panache as Clara. The film also has distinctive settings: one of the contributions by Jordan. We cut between a run-down English seaside town [actually Hastings] and a barren Irish landscape [the Barra Peninsula]. Visually the film is a real pleasure. We alternate from forbidding and mysterious landscapes, to the washed out neon-lit resort, and moments of vivid colour as the victim toll mounts. The transformation from human to undead is both impressive and distinctive. The plot brings together a variety of strands from vampiric literature and C19th melodrama. Some of this is deliberately over the top, and whilst there are surprises some of the mechanics are signalled well in advance. The title Byzantium seems to be a rather arbitrary inclusion with a link to the early medieval world. I watched the film at the Vue Cinema in central Leeds. The foyer proudly informs patrons that all the projectors are 4K; however, they neglect to provide any information about whether the DCPs are 2K or 4K. I remember a profile of the Chief Executive of Vue in The Guardian, where he said he was ‘passionate about film’. His cinemas need a little more of this. The film was screened in 2.35:1 though the masking remains as for 16:9 [one of the oddities of this cinema is the aspect ratio of the screens]. And I do not remember any warning about ‘mobile phones’ before the screening commenced. Sure enough, just as we started the climatic sequence one lit up in the row in front of me. Vampires in Byzantium have a really impressive nail on the index finger: I would have traded for one at that moment. I thought it was one of the best films Neil Jordan has made in a while, much better than his Interview With a Vampire. I liked the way he (and/or Moira Buffini) played around with the genre without moving too far away from vampire lore (cf Joss Weedon’s redemption-seeking vampires). What made the film are, as you suggest, the two terrific central performances of Gemma Arterton and Saoirse Ronan (you’ve got a typo in her name), particularly the latter, which forms the central core of the film; and the terrific mise en scene/cinematography. The film looked so good. Seaside towns off-season can be a bit depressing but Hastings under Neil Jordan’s eye looked very impressive. I particularly liked the “over-the-top” sequences on the island, with the waterfalls gushing down in a rush of pure white to be blended with blood – a change from the boring old fangs initiation routine we’re familiar with from the Hammer films (cleverly referenced in Byzantium).